This is our first year growing celery. I'm growing just a couple of plants as an experiment, so this is all new to me as well. This is all information that I have gathered from other resources, and I hope it helps both me and you, my reader. 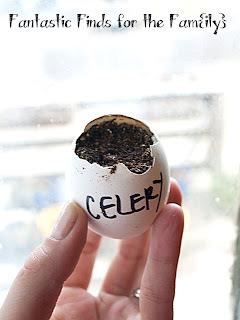 I started my seedlings in eggshells, on 3/4/12 in a regular seed starting mix. According to my package, these should sprout in 10-25 days. I just scattered these on the top of the soil, as they need light to germinate. One of my gardening books indicates that it can take a long time to germinate and to stay patient. When two true leaves appear, transfer them into 3" pots and let them establish. Then you'll harden them off and replant them when they have 5-7 true leaves. According to one book, temperatures on these seedlings should never fall below 50 degrees for longer than 12 hours or they will bolt later in life. If the weather isn't good enough for transplanting, trim them back with sharp scissors, keeping them at about 3" until outdoor temperatures are higher. If your space is limited, container growing is good, when grown in deep containers. When they reach 12" in height, begin blanching (or tightening) the plant by binding loosly with a collar by placing a 9-10" piece of thick paper around the stems of the plant. Add more paper as the plant grows and develops. These plants do not like to be dry. Keep them very watered, especially when it is warm. You'll be able to harvest this difficult plant somewhere between 100-120 days after you've planted it. Harvest it gently by pulling the roots out from the ground with a garden fork. If you have any helpful hints on growing celery please leave a comment! Check back to see how our celery does!